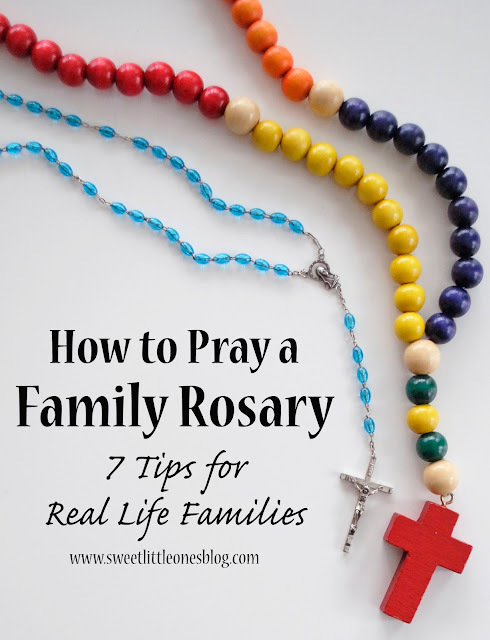 I'm so excited to share this brand new line of beautiful saints necklaces with you...and give you a chance to win one! My friend Maria from Ave Maria Faith Crafts came up with her Saints & Sayings line as the result of her deep love for the saints and their legacy. 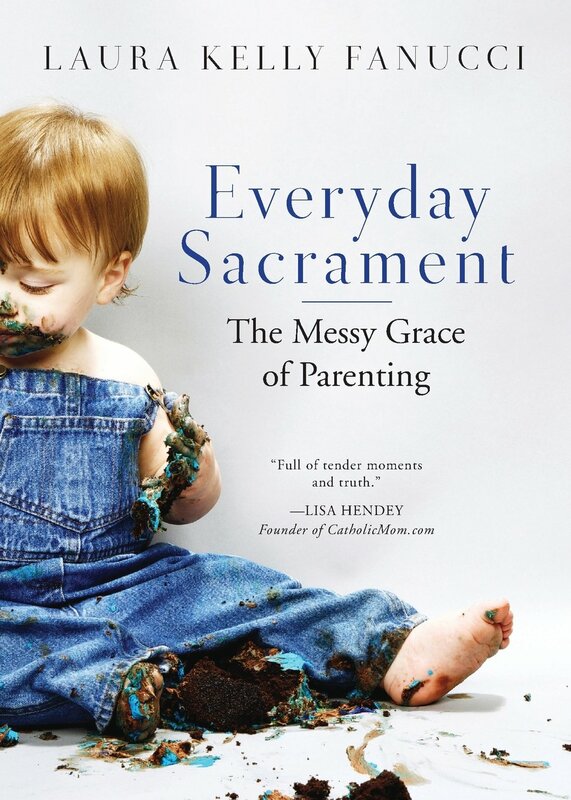 She wanted to create a wearable reminder that would inspire us to be the best versions of ourselves and to live our Catholic faithfully and boldly. 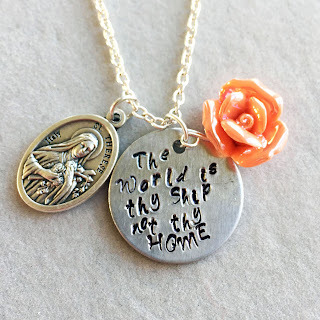 My favorite part is that you can customize your necklace to feature just about any saint or quote attributed to them! I am getting matching necklaces for myself and my daughter that feature St. Thérèse of Lisieux (pictured below), but customized with my favorite quote of hers: My vocation is love. 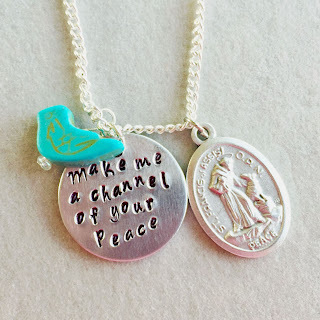 The one-inch medal and quote are accompanied by a handmade charm showcasing either an item or colors associated with the saint. 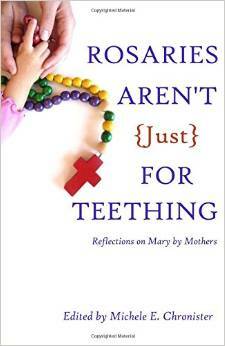 During the month of October, her Saints & Sayings necklaces are only $15! Use the promo code ANNIVERSARYSALE15 at checkout to get your necklace for only $15 (plus FREE shipping in the U.S.!) The price will go up to $18 on November 1st so don't wait! 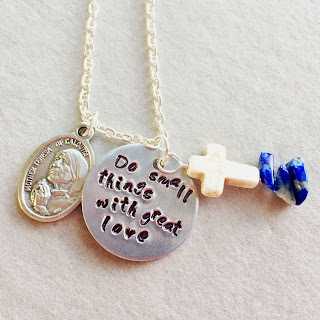 You can order one of her Saints & Sayings necklaces for only $15 (with free shipping!) 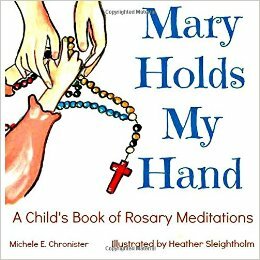 at Ave Maria Faith Crafts starting today (with the promo code ANNIVERSARYSALE15)! Ok, on to the giveaway! 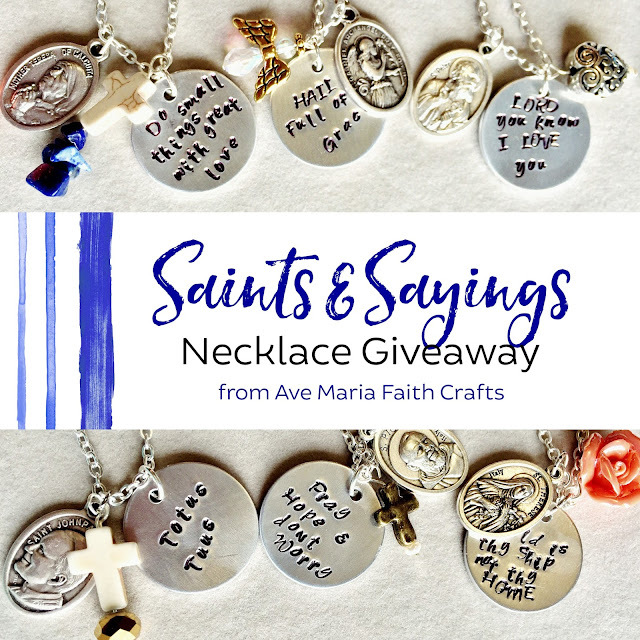 Maria and I have teamed up to give you a chance to win one of her Saints & Sayings necklaces! 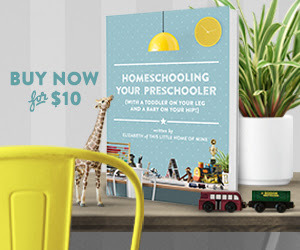 Win one for yourself or give as the perfect gift to a loved one! This giveaway will run from October 25 - October 30. Winner will be announced on November 1 - All Saints' Day! 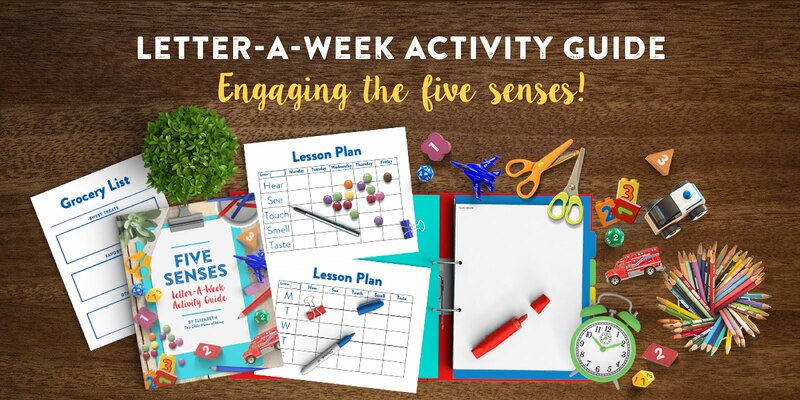 There will be more ways to enter on Facebook and Instagram this week so be sure to follow along and grab some extra entries there! The fine print: Any necklace qualifies for the giveaway! The winner may even choose a custom order as well, provided that the saint of their choosing is currently depicted on a medal. If the winner is located outside of the United States, the winner will need to pay shipping. Thanks and good luck! 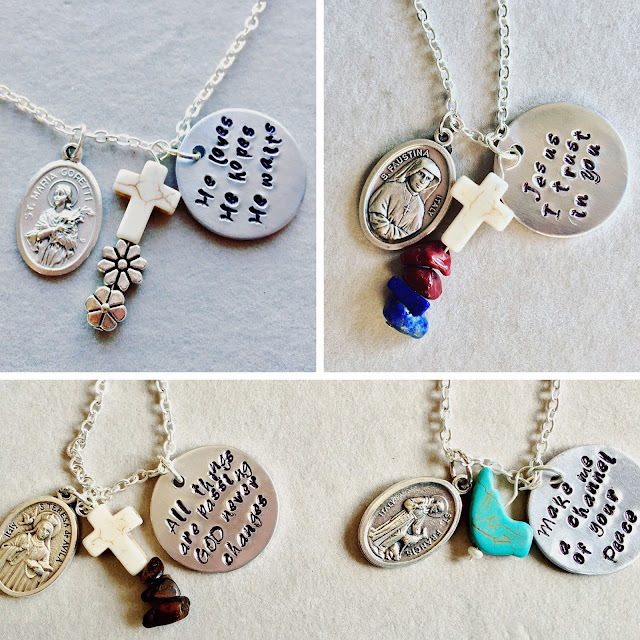 Which one of the Saints and Sayings necklaces is your favorite? Good luck and Happy Tuesday! 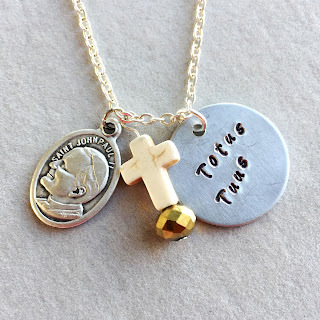 *Customization details: Your custom Saints & Sayings necklace can be customized to feature just about any saint and quote. The quote may need to be shortened in order to fit. The stamped letters' color can be customized as well, with choices of black, red, blue, pink, and green. Each necklace is hand stamped and is about 20 inches long (but the length can be customized). To order a custom necklace, please contact Maria by email at faithcrafts@hotmail.com or by messaging her at Ave Maria Faith Crafts on Etsy. 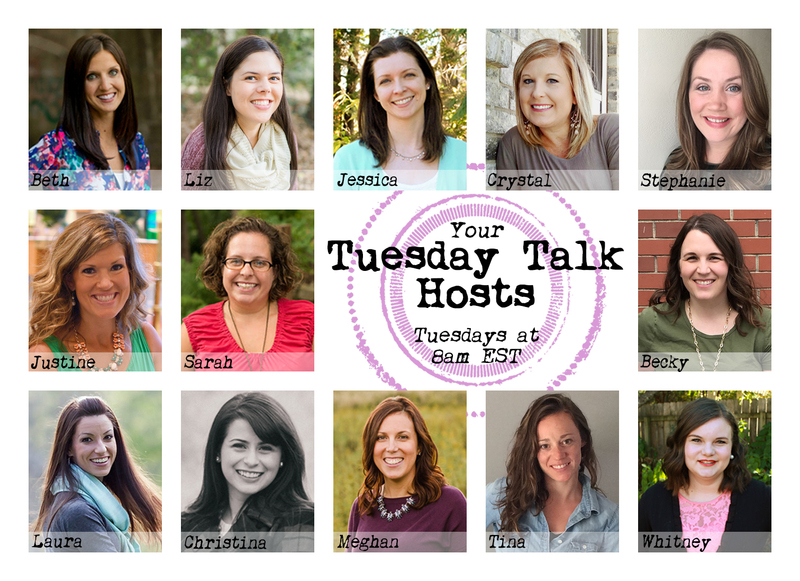 Welcome to Tuesday Talk #95!